American Motor Body Co. had no connection with the Buffalo, New York firm, American Body Co., although the former firm is often referred to in error as American Body or American Body Manufacturing. The American Motor Body Co. was created by the American Can Company as a Delaware Corporation on February 18, 1918. The purpose of its founding was the eventual takeover of the plants and assets of two firms, the Wadsworth Manufacturing Company of Detroit, Michigan and the Hale & Kilburn Corp. of Philadelphia. Pennsylvania. Wadsworth’s president, Frederick E. Wadsworth, had been previously involved with American Can Company’s competitor, the National Can Company. Surprisingly both firms’ Detroit branches produced stamped automotive products in addition to tin cans. At the time of the sale, Wadsworth Manufacturing was supplying closed automobile bodes to the Ford Motor Co. and other Detroit automakers. American Can’s Detroit plant was located at 1400-1500 Trombly St., (the same facility sometimes used 6234-6290 Russell St. as its address), National Can’s plant was located at 2566 E Grand Blvd. At that time Hale & Kilburn was controlled by J.P. Morgan & Co. interests and like Wadsworth, was involved in producing automobile bodies. American Can’s president, Frederick S. Wheeler, hoped the two related business would give his firm a foothold in the emerging all-metal automobile body building business. Hale & Kilburn’s president, Joseph A. Bower, spearheaded a re-organization of the firm during 1917 in hopes of attracting a buyer. When the project was finalized in January, 1918, he was rewarded with a promotion to vice-president of the J.P. Morgan’s Liberty National Bank of New York. On September 19, 1920 the stockholders of the Hale & Kilburn Corporation accepted the plan whereby, that company would be taken over by the American Motor Body Corporation. The $1,000,000+ merger included the Wadsworth Manufacturing Company of Detroit. The Bankers Trust Company was appointed the transfer agent for Class "A" stock of the American Motor Body Company. When it was appraised on Dec. 31, 1918, the 4-acre Hale & Kilburn plant comprised five modern buildings of fireproof and slow-burning metal construction which was valued at $2,246,819. At the time, Hale & Kilburn was engaged in the manufacture of pressed metal automobile parts and units, car seats for steam and electric railways and other pressed metal products. Their entry into the automotive field was as a direct result of a talented former employee named Edward G. Budd. Edward Gowan Budd was born on Dec. 28, 1870 in Smyrna, Delaware to Henry George Budd, Smyrna’s Justice of the Peace. From an early age, Budd had an aptitude for all things mechanical and following his graduation from high school, he apprenticed as a machinist at Smyrna’s G. W. and S. Taylor Iron Works. He moved to nearby Philadelphia in 1890 taking a job as a machinist at the Sellers Machine and Foundry Co. and later on the Bement-Pond Tool Company (Niles-Bement-Pond starting in 1899), a manufacturer of machines tools and hydraulic presses. At night Budd took classes in drafting and engineering at the Franklin Institute, the University of Pennsylvania and the International Correspondence School. A friend of Budd’s named Thomas Corscaden designed a stamped sheet-steel pulley that was both lighter and cheaper to produce than traditional cast-iron versions and sold the design to George Cresson, the owner of the Philadelphia’s American Pulley Co. Budd joined his friend at American Pulley as their chief draftsman in 1898, and married his wife Mary the following year. Aside for their pulleys, American manufactured many other items including stamped steel pedestals that were built for Hale & Kilburn, a Philadelphia furniture manufacturer that specialized in producing seating for railways, subways and trolleys. 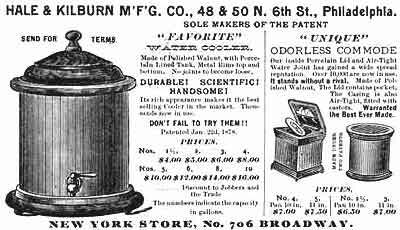 Originally located at 48-50 North 6th St. (at Arch St.), Hale & Kilburn started off building parlor furniture, commodes and other household products in 1873. By the turn of the century they had become famous for their streetcar and railroad seating. They even developed a “walkover” railroad bench seat that incorporated a pedestal that allowed it to be rotated 180 degrees allowing it to face forward or backward depending on the direction of train. At the time, most of their seating was built using cast-iron frames and pedestals. Budd’s expertise in stamped steel engineering caught the attention of Hale & Kilburn’s management and in 1902 they hired him away with an offer twice his former salary. His job was to develop pressed steel replacements for their cast-metal products, thereby reducing both their weight and their cost. Using a combination of sheet steel stampings and oxy-acetylene welding, he succeeded and was appointed works manager within a couple of years. In 1895, French chemist Henry Le Chatelier discovered that combustion of equal quantities of acetylene and oxygen produced a 6000° F flame, a flame significantly hotter than any produced by the various gases used previously. In 1903, Thomas Wilson created the first oxyacetylene torch, and in 1907, the country’s first oxygen plant was built in Buffalo, New York. A Frenchman named David Bourneville developed a technique that was perfected by a Hale & Kilburn employee named Morris Lachman, who worked with Budd and deserves a share of the credit for his pioneering work in the field. Budd and Lachaman also experiment with arc-welding, a technique developed by an American named C.L Coffin in 1890. With the introduction of coated stick electrodes in the early 1900s, the process could now be used to produce very strong spot welds, a key to producing automobile bodies. With the new technology, Hale & Kilburn produced hundreds of Budd-designed all-steel passenger cars for the Pullman Company in the early 1900s. The benefits were similar to that of the all-steel auto body, they were lighter, stronger and enjoyed the additional benefit of being significantly more fire resistant, a factor very important to an industry plagued by deadly railway passenger fires. 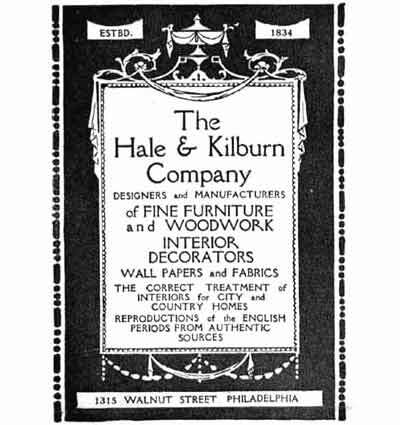 Business increased to the point that Hale & Kilburn moved to larger quarters located adjacent to the main Pennsylvania Railroad line at 2700 17th St. and Lehigh Ave in 1905. Budd was given a salary increase as well as stock options that proved useful a number of years later. Within a short time Budd began experimenting with early attempts at shallow-draw sheet-metal stamping, producing small runs sheet metal panels for the King and Paige Co.’s composite automobile bodies. In 1909, Emil Nelson, Chief Engineer of the Hupp Motor Car Co. approached Budd looking for help with developing a true all-metal body. In a 1948 address Budd recalled: "None of the Detroit plants would contract for this body,"
Recent improvements in sheet steel production now made it possible to produce larger stampings with a uniform thickness, however the compound curves needed for automobile bodies still had to be built from numerous individual stampings that had to be welded together by hand. However, both Hupp and Budd felt that the future lay in stamped sheet-steel bodies. Hale & Kilburn began to supply Hupp with a number of pressed steel panels and Budd started development of an all-steel automobile body. 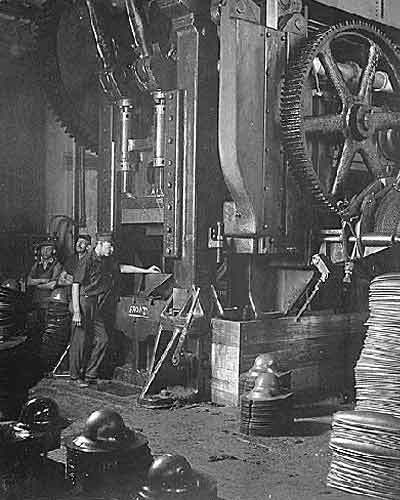 Deep draw stamping technology had yet to be developed so Budd and Nelson devised a system where the body’s numerous steel stampings were welded together by hand and supported by a crude system of angle iron supports that held the welded subassemblies together. The disassembled bodies were shipped by rail to Detroit where they were put back together, painted and trimmed in the Hupp factory. The resulting automobile was the 1912 Hupmobile Model 32, the first car produced in Detroit with an all-steel production body. In addition to the Model 32 touring and roadster, an all-metal coupe was offered. Unfortunately Nelson left Hupmobile later that year and subsequent Model 32s were equipped with standard composite bodies. Hupmobile was not the first to explore the all-metal body. Both Marmon and Pierce-Arrow had been building riveted cast aluminum bodies for a number of years, however the expense and expertise involved made cast aluminum impractical for a low-to-medium priced automaker like Hupp. During 1911 Hale & Kilburn was acquired by J.P Morgan for $9 million, and the existing management was replaced by Morgan administrators who had little to no experience in the metal-stamping business. Budd quickly became frustrated and suffered a nervous breakdown later in the year. After a couple of month’s recuperation in Europe, he returned to Philadelphia in early 1912 and resigned. With $75,000 of his own savings, $15,000 from a friend of the family’s named A. Robinson McIlvaine and $10,000 from another friend, J.S. Williams, Budd formed the Edward G. Budd Mfg. Co. on July 22, 1912. The firm was capitalized at $100,000 with Budd as president and McIlvaine, secretary. An office was leased in the North American Building at 121 S. Broad St., Philadelphia, and two good friends of Budd’s from Hale & Kilburn, Joseph Ledwinka and Russell Leidy joined the firm. Even without Budd, Hale & Kilburn prospered and at the time was the premier manufacturer of railcar seating in the county. On September 19, 1920 stockholders of the Hale & Kilburn Corporation accepted a takeover plan orchestrated by the American Can-controlled American Motor Body Co. Included in the reported $20,000,000 merger was the Wadsworth Manufacturing Company, of Detroit. At that time Wadsworth was supplying closed bodies to many of Detroit’s automakers including Ford and Wadsworth’s three neighbors, Hudson, Maxwell & Chalmers. For the next few years, American Motor Body railcar seating was sold under the Hale & Kilburn trade name. Hugo Scherer (b.1859-d.1923), a major stockholder in the Wadsworth Manufacturing Co., was the person most responsible for the firm’s entry into manufacturing automobile bodies. Scherer was born in October 9, 1859, in Detroit, Michigan to Augusta and John Conrad Scherer, two German immigrants from the state of Hessen. In 1851 the elder Scherer (sometimes misspelled as Shearer), who was a physician, established an apothecary in downtown Detroit at 39 Michigan Ave E., near the old county office building. Hugo obtained his early education in the public schools of Detroit and after graduation went to Europe where he spent six years at University. Upon his return to the states, Scherer went to work in his father’s drug store, eventually taking charge of the business, which he inherited upon the death of his father. Hugo’s younger brother, Otto Scherer (b.1865) decided to pursue a career in medicine and after a lengthy course of study became a prominent Detroit physician. By 1879 Scherer’s pharmacy had relocated to 280-284 E. Jefferson Ave. The firm’s spacious new quarters allowed them to get into the hardware and carriage goods business, which by the mid 1880s had become their specialty. By 1887, the renamed firm, H. Scherer & Company, was the city’s main source of wholesale carriage hardware and had begun the manufacture of their own line of carriage dashboards. Subsequent directories list the firm as a manufacturer and distributor of carriage drop forging, hardware and trimming material. He also owned a mansion at 745 E. Jefferson Ave. and in 1898 commissioned Detroit architect Louis Kemper to design and build him a magnificent summer residence at Grosse Pointe Farm, the summer home of his friend Frederick E. Wadsworth. An early automobilist, Scherer was a founding member of the Detroit Automobile Club, which was formed in 1902. And although they share the same name, Detroit’s Hugo Scherer was not directly related to the infamous Mexican bankers, Hugo Scherer Sr. & Hugo Scherer Jr. of Mexico City. The new 3-story steel and cinder block structure was constructed on the north side of E. Jefferson, at the northwest corner of its intersection with Bellevue Ave., across the street from their existing office. "Detroit Motor Car Supply Co. - A large exhibit of automobile clothing for all weathers, automobile accessories and supplies, was made. Particularly seasonable were the robes and weatherproof coats shown. This concern manufactures automobile bodies, tops, tire cases, clothing, caps, storm aprons, dash clocks, wind screens and other automobile accessories. The company claims to be the largest manufacturer of automobile bodies in the United States, and had in the Armory an exhibit of several up-to-date styles of coupé, landaulet and limousine bodies. A special runabout top, complete with side curtains, storm front and body irons, appealed particularly to the users of small cars." In later years Detroit Motor Car Supply was listed as a manufacturer of commercial bodies for Fords, but is mainly known today as the manufacturer-distributor of Sandow 2-cycle stationary gasoline engine. The success of Hugo Scherer’s various business interests can also be attributed to his friend and business partner, Frederick Elliott Wadsworth (1868-1927). Wadsworth was born in Durham, Middlesex County, Connecticut to James W. Wadsworth, a member of one of Connecticut’s most prominent families. After a public education Frederick attended university after which he made his home in Detroit, Michigan. In 1896 Wadsworth and Scherer helped organize the Detroit Engine Works and in 1901 Wadsworth was instrumental in the formation of the National Can Company, serving on the firm’s board of directors for a number of years. Surprisingly, National Can’s Detroit plant produced auto parts in addition to tin cans. Located at 2566 E Grand Blvd., the firm produced ‘Mayo’ and ‘National’ brand radiators under the Mayo patents as well as other stamped, sheet-metal auto parts. National’s radiator business was eventually purchased by the McCord Radiator & Mfg. Co.
Wadsworth’s experience in metal stamping proved helpful when he and Scherer got into the boat and auto body building business and Wadsworth’s deep pockets helped finance the pair’s business ventures, which included the following: Columbia Engine Company, Detroit Boat Company, Detroit Engine Works, Detroit Forging Company, Detroit Motor Car Supply Company, Michigan Steel Boat Company, St. Clair-Athol Rubber Company and the Thrall Motor Company. Columbia Engine, Detroit Engine and Thrall Motor manufactured 2-cycle marine and stationary engines rated between 2- and 50-hp. Also offered by Detroit was a range of light kerosene-powered 6-to 18 hp Wadsworth farm tractors. Detroit Forging specialized in drop-forged automobile parts, specifically convertible top hardware. St. Clair-Athol Rubber Co. manufactured rubber-coated automobile fabrics that were also used in convertible tops. Detroit Motor Supply manufactured automobile bodies and distributed Sandow-brand 2-cycle engines, which were actually a product of the Detroit Engine Works. Michigan Steel Boat and Detroit Boat manufactured small boats which more often than not were powered by engines manufactured by the Detroit Engine Works. 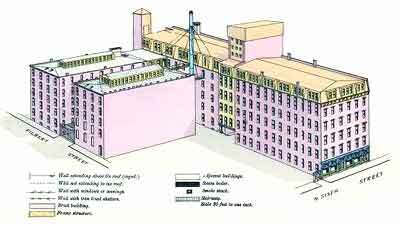 Not surprisingly, all of the above firms were located in the same factory, which was operated under the auspices of the Wadsworth Manufacturing Co. The firm bearing Wadsworth’s name also manufactured automobile bodies, tops, and accessories for Detroit’s automakers, many of whom were conveniently located along E. Jefferson Ave. The Wadsworth factory was located adjacent to a siding of the Detroit Terminal Railway, which later on enabled them to get large contracts with the Ford Motor Co.
Scherer and Wadsworth organized the Detroit Engine Works in 1896 in order to manufacture two-cycle engines for marine and agricultural use. The firm later produced a large number of products including light tractors, stationary engines, reverse gears and various other machined, drop-forged and cast-metal products. Scherer and Wadsworth marketed their engines under the Sandow, Detroit and Columbia trade names while others were sold to third parties who re-badged them and marketed them as their own products. These third-party firms included: American Engine Co., Bessemer Gas Engine Co., Caille Perfection Motor Co., Middleditch Engine Co., Petoskey Iron Works and Termaat & Monahan Co.
As early as 1902 the Detroit Engine Works was using 1256 E. Jefferson Ave., Detroit, as their address. In later years, numerous addresses - all indicating the same group of structures - were used, most were on E. Jefferson Ave. (1122, 1154,1242, 1250,1252,1256, 1273, 1280, 1300, 1347, although a few gave a Bellevue Ave. address (115, 417,420, 425). Just as it does today, Bellevue ran alongside the west side of the new (built in 1905) factory/office building located on the north side of E. Jefferson. The firm continued to use the older factory located across the street on the south side of E. Jefferson until it moved to Conners Creek. Scherer and Wadsworth were also partners in real estate. In 1903 they constructed a neighborhood of frame cottages in the summer resort of Grosse Pointe which became known as the ‘Cabbage Patch’. In 1916 Scherer formed the Hugo Scherer Land Co. to manage his various real estate holdings which included the Scherer Block (280-284 E. Jefferson Ave.) and a large commercial structure located at 936-944 Woodward Ave.
Scherer and Wadsworth’s early business ventures shared the same downtown Detroit address - 280-284 Jefferson Ave (East) - as Scherer’s carriage supply firm. The pair’s second recorded business venture, the Michigan Steel Boat Company, was incorporated on December 27, 1901 with Hugo Scherer, president; and Frederick E. Wadsworth, secretary-treasurer. The firm marketed boats under the Detroit and Michigan Steel Boat brands, and were likely resold and marketed by third parties under other brand names. Period advertisements stated that Michigan Metal/Detroit Boat manufactured 64 different styles of boats ranging in size from 14 to 35 feet. The Michigan Artisan reported in their June 10th 1906 news paper that the Michigan Steel Boat Company of Detroit was about to "engage in making knock down furniture." In fact surviving advertisements indicate that Scherer and Wadsworth had been leasing space next to the former Olds Motor Works plant as early as 1902. Although his firm was originally located in Lansing, Michigan, Ransom E. Olds was prompted to relocate to Detroit in 1899 and a new factory was erected at 1308-1318 E. Jefferson Ave., production commencing in 1900. When a the new factory burned down on March 9, 1901, the Lansing, Michigan’s Businessmen’s Association offered the firm a parcel of land ten times the size of the Jefferson Ave facility, prompting a return to Lansing. A 1905 description of the Michigan Steel Boat/Wadsworth Manufacturing property called it “the largest steel boat building establishment in the state.” The plant’s 100 ft. x 1200 ft. grounds included the brand new three-story cement block factory, office and showroom and 6 smaller structures located across the street. The modern plant was equipped with electric lighting, automatic fire extinguishers and an in-house telephone network. The facility’s electric power was provided by a private generating plant. Unused space at the Wadsworth complex was rented out to various third parties, one of which was the Nyal Co., a nationally-known manufacturer of women’s face cream. The Detroit Stove Works was located one block to the east at 1320-1360 E. Jefferson Ave. and in late 1909 the Hupp Motor Car Co. moved into a new facility built on the former Olds grounds at 1300-1320 E Jefferson Ave. (at Concord). When Hupp relocated to larger facilities at Milwaukee and Mt. Elliott Aves in 1912, the King Motor Car Co took over Hupp’s Jefferson Ave factory. Located to the west of the Wadsworth factory at 1210 E Jefferson Ave., was the national headquarters of the Stove Mounters Union of North America. During the late 19th century Detroit was the stove manufacturing capital of the US and three of the nations largest manufacturers; the Detroit Stove Works, Michigan Stove Works and Peninsular Iron Co. were located along E. Jefferson Ave. However, there is no evidence the vehicle ever made it past the prototype stage, and even the existence of a prototype is doubted. Frederick E. Wadsworth was a founding member of the Detroit Aero Club, and created a small scandal in 1911 when he divorced his current wife and married a famous British actress. The actress, Mary Mannering (b.1876 d.1953) was born in London where she studied for the stage under Hermann Vezin. She made her debut at Manchester in 1892 under her own name of Florence Friend. In 1896 New York theatrical producer Daniel Frohman brought her to New York where she changed her name to Mary Mannering, the maiden name of her father's mother. Her first star billing came at Buffalo, NY in 1900 when she appeared in ‘Janice Meredith’ in the title role. For the next ten years she starred in various productions; White Roses (New York, 1901); The Truants (Washington, 1909); The Independent Miss Gower (Chicago, 1909); A Man's World and The Garden of Allah (New York, 1910). After her 1911 marriage to Wadsworth, Mannering retired from the stage, and devoted her life to assisting her husband in civic and business affairs. In 1912 she was credited with building nineteen cottages for working men and their families on the former Wadsworth estate in Gross Pointe Farms. By the late teens she was listed as Vice-president of the Michigan Boat Works. Later in Life she was interviewed by Good Housekeeping, who published her interview in an article titled The Home, The Stage and the Woman. In 1911 Wadsworth, built a hydro-aeroplane named the Flying Fish which debuted at the New York Boat Show. The unusual vehicle was designed to skim on top of the water at speeds up to 65mph, with the ‘skipper-pilot’ seated in a wicker chair at the rear of its canoe-like hull. The Flying Fish was successfully tested on the ice of Lake St. Clair but no further development occurred. During the mid-teens Wadsworth Manufacturing offered a very successful "Full Vision Sedan Top" for Model T Touring Cars, a lined and insulated top very similar to the all-weather convertible tops offered by the Springfield Metal Body Co. and others. Prior to his marriage to Mannering, Wadsworth purchased an estate in Irvington-on-the-Hudson, NY and in 1916 announced that he intended to live in New York permanently and was putting his Grosse Pointe estate on the market. Wadsworth passed away on March 28, 1927 at his Clarke Ave. home in Palm Beach, Florida, leaving an estate of $1 million. By 1915 Michigan Steel Boat’s officers were as follows: Hugo Scherer, President; Frederick E. Wadsworth, Secretary and Treasurer; H. E. Cronenweth, General Manager; W. C. Rowling, Purchasing Agent; and A.M. Ratigan, Advertising Manager. The Wadsworth plant at 1252-1270 E Jefferson was purchased by the United States Rubber Co. (manufactured the United States Tire), as was the former Hupmobile/King plant at 1300-24 E. Jefferson (at Concord). Originally from Chicago, the Morgan & Wright Bicycle Tire Co., moved to Detroit to take advantage of its burgeoning automobile industry. Its first Detroit plant was erected on a portion of the former Old Motor Works parcel, east of the Wadsworth plant. Completed in October of 1906, several of Detroit’s Automobile Shows were held inside the 900,000 sq ft complex. Morgan & Wright was purchased by the United States Rubber Company in 1914. US Rubber wished to expand the existing plant and made a generous offer for the Wadsworth Manufacturing Co. complex. With the proceeds Scherer and Wadsworth purchased a large undeveloped plot on E. Jefferson, 3 miles east of the current facility in the area known as Conners Creek. Located on the north side of E. Jefferson Ave., the new facility featured a railroad siding connected to the Detroit Terminal Railway, which gave them direct access to Ford Motor Co.’s Highland Park and River Rouge assembly plants. Plans were drawn up by Detroit architect Albert Kahn and construction of the new modern facility - which was bordered by Kercheval St to the north and Corey Place to the west - commenced in 1915. In June of that year the firm reported that they had spent $30,000 on new construction at the Conners Creek factory. Competition was fierce in the small engine business so the manufacture of Detroit Engine Works’ marine and stationary engines did not continue after the war and the firm’s spare parts and service rights were purchased by the Standard Motor Parts Company in 1917. Located at 584-590 Franklin St, Detroit, Standard Motor Parts specialized in providing service and spare parts to owners of bankrupt, orphaned and obsolete automobile, tractor and small engine manufacturers. Originally located in Kalamazoo, the firm was founded by Edwin J. Dayton who relocated the firm to Detroit in the early teens. The firm prospered, eventually establishing service depots in Syracuse, New York; Cleveland, Ohio; Lebanon, Muncie and Newcastle, Indiana; and Chicago, Illinois. By 1960 the massive U.S. Rubber Co. plant had expanded to 20 acres, taking up the entire south side of E. Jefferson from the Belle Isle Bridge to Meldrum St. U.S. Rubber became Uniroyal in 1961, and the plant remained in operation until July of 1981. A May 17th 1918 inspection of the Wadsworth plant by the State of Michigan Dept of Labor gave the following statistics. Wadsworth employed a total of 1,125 persons of which 951 were male, 174 female, and 4 were under the age of 16. It appears as if Scherer’s interest in Wadsworth Manufacturing and Michigan Steel Boat had been sold after the firm moved to the new plant. Wadsworth’s new Vice-president, Henry E. Bodman, was closely associated with both Packard and Ford and it is believed he represented the automakers interest who at that time owned a substantial portion of Wadsworth Manufacturing’s stock. Henry E. Bodman was born in Toledo, Ohio on Aug. 8, 1874 and admitted to the Michigan bar in 1897. By 1918 he had become chief attorney for the Packard Motor Car Co. and would soon become one of the Ford Motor Co.’s lead attorneys. He later served as Henry and Edsel Ford’s personal attorney and in 1927 founded the Detroit law firm, Bodman LLP, which remains one of Detroit’s largest firms. During World war II Bodman served his country as chief counsel for the Automotive Council for War Production. Bodman also served on the board of directors of a number of Detroit-based firms among them the Guardian Detroit Bank, Provident Loan Co., Detroit City Gas Co. etc. During the mid-to-late Twenties he served as chairman of the Guardian Trust Co.
Scherer remained friends with Frederick E. Wadsworth and continued to operate H. Scherer & Co., Detroit Forging and St. Clair-Athol Rubber from his offices at 280-274 E Jefferson. Shortly before his death Scherer stated he had decided to retire from active business and place the affairs of H. Scherer & Co. in the hands of his trusted staff, which included Clemons H. Davis (Manager), Hugo Miller (Secretary-Treasurer), and Lovell E. Kraus. All three men hade been led by Scherer to believe that they would be compensated beyond their salary if they remained with the company after Scherer’s retirement. Unfortunately, those wishes were not noted in his will and when Scherer passed away in November, 1923, the firm passed to his wife - Clara Schmidt Scherer – and two daughters, Marion Scherer Livingstone & Dorothy Scherer Higbie. Consequently Davis, Miller and Kraus sued the estate and after a 4-month long court battle the firm of Davis, Kraus & Miller was formed and the assets of H. Scherer & Co. were transferred to the new corporation in exchange for all of its stock consisting of $250,000 of preferred which was issued to Scherer’s widow and two daughters, and $250,000 of common, which was issued to Davis, Miller and Kraus. Davis, Kraus & Miller relocated into leased quarters at 442 E. Jefferson and continued to supply Detroit’s auto industry with textiles and trimming materials into the early thirties. Located at 2700 E. Jefferson Ave., just across the street from Wadsworth’s new plant, was the main factory of the Chalmers Motors Co. Starting in 1917 Chalmers leased a portion of their facility to the Maxwell Motor Company for an initial five year contract. Walter P Chrysler joined Maxwell in the summer of 1920 and on May 7, 1921 Maxwell-Chalmers was merged into the Maxwell Motor Corp. In 1923 he became president of Maxwell and turned Chalmers into a subsidiary. A few months later, he incorporated the Chrysler name and in late 1923 production of the Chalmers automobile ended. In January 1924, Walter Chrysler launched the well-received 6-cylinder Chrysler automobile and on June 6, 1925 the Maxwell Motor Company was re-organized into the Chrysler Corporation. The new Ford Model T center door sedan was introduced in September 1914 as a 1915 Model and all of that year’s aluminum-clad bodies were built by Fisher Body Company. They arrived at Highland Park fully painted and upholstered, ready for bolting to a finished Model T chassis. In its inaugural year, the sedan did not sell well with only 989 sedans sold. The center door sedan was used until mid-1923, when it was replaced by the all-new Fordor sedan which was built by Ford at its own body plants. 1916 and later center door sedans were made of steel, and it is believed that Fisher supplied most, if not all of the 1916 model year’s bodies as the new Wadsworth plant wasn’t up and running until midyear. For 1917 demand increased four-fold and Ford split the contract between Wadsworth Manufacturing and Fisher Body. Although Americans were aware of the ongoing European conflict, the US didn’t become officially involved until April 1917. For the next eighteen months automobile production was curtailed, but not eliminated as in World War II. During the conflict production of the Model T dropped by approximately 35%, with the heaviest losses occurring during the 1918 model year. During the war Model T production was as follows: 1917 - 834,662 units; 1918 - 382,246 units; 1919 - 828,544 units. During 1918 and 1919 center door contracts were shared between Wadsworth and Fisher. Excess capacity at Ford’s Highland Park plant was used to produce a wide assortment of military products, which included steel helmets, V-12 Liberty Aero engines, a Model T-powered tank and the novel Ford Eagle patrol boat, a 200-foot U-boat chaser designed by the Navy. A purpose-built assembly plant was built at the intersection of the Rouge River and Roulo Creek in order to build the Eagle. The original contract called for delivery of 100 ships by December 1, 1918, but was cut to 60 when the Armistice was signed in November of that year. Although the first keel was laid in May, 1918, none of the Eagles were commissioned in time to see actual wartime service. The last Eagle left the River Rouge plant in July, 1919. The April strike of some 1,500 workers (the 2,500 quoted in the paper was highly inflated), about 90% of whom were in the union, was precipitated by the company's desire to dictate who should be elected to the workers' committees. Under strict orders from Ford’s representatives, Wadsworth management refused to meet with the committee, and presented the ‘Six-Dollar Wage’ statement to placate the public. Not only did this strike constrain Ford’s output during a period of potentially booming sales, but Ford was worried about the UAAVW getting a foothold in his own plants. Wadsworth management brought in idle Ford employees for strike-breakers and advertised for help all over the country. Fed up with the labor unions interference, in mid-July 1919 Henry Ford began installing his own body-building equipment into Building B of Ford’s Eagle Shipbuilding plant. Although the local Board of Commerce tried to assist Wadsworth/Ford in its efforts to break the strike, negotiations ended when the Wadsworth plant was totally destroyed by a ‘suspicious’ fire on the night of Friday, August 1, 1919. “Detroit, Mich, Aug. 2.—Damage estimated at more than $1,000,000 was caused last night when the Wadsworth Manufacturing plant, in the east end of this city, was almost entirely destroyed by fire and other business houses slightly damaged. The fire is thought to have been caused by combustion, and originated in the paint shop of the Wadsworth company. The Sibley Lumber company suffered $100,000 loss and the Inside Inn hotel was totally destroyed. The UAAVW, the predecessor of the powerful Auto Workers Union (AWU), experienced a surge in membership in the immediate postwar years (1918-1920). Employers, for their part, were seeking to reassert control over their businesses as government wartime regulation abated. As these social forces collided, a huge strike wave occurred and a number of auto plants in several cities were struck. Among these was the Wadsworth Manufacturing Company. The immediate result of the fire was the loss of 1,500 UAAVW jobs, the long-term result was the sale of the firm to the American Motor Body Corp., the auto body building division of the American Can Company. By early 1920, Wadsworth had rebuilt the factory and sedan bodies were once again being shipped to Ford. However, Ford had contracted with other firms during the lengthy fire-induced shutdown, so the unwelcome additional capacity was used to construct production bodies for other Detroit manufacturers such as Gray, Hudson, Maxwell and Chalmers. Although the firm had sold its spare parts business, Michigan Steel Boat Company continued to be listed in the Detroit directories at the Corner of Kercheval Ave & Conner Creek, the same locations as Wadsworth Manufacturing. At that time Michigan Steel Boat’s officers were as follows: Frederick E. Wadsworth, president; Mary M. Wadsworth, vice-president; H.E. Cronenweth, treasurer. For many years Herbert E. Cronenweth, (b.1884) was associated with the management of Scherer and Wadsworth’s various enterprises. When Wadsworth Manufacturing was dissolved in 1920, Cronenweth headed to Los Angeles where he became involved in the oil and real estate business heading the Acme Petroleum, L-Her Oil and Land, and L-Her Realty Co.
On December 8, 1920, Michigan Steel Boat Company filed a notice of dissolution. The reason; the firm’s plant and headquarters had just been purchased by the American Motor Body Company. 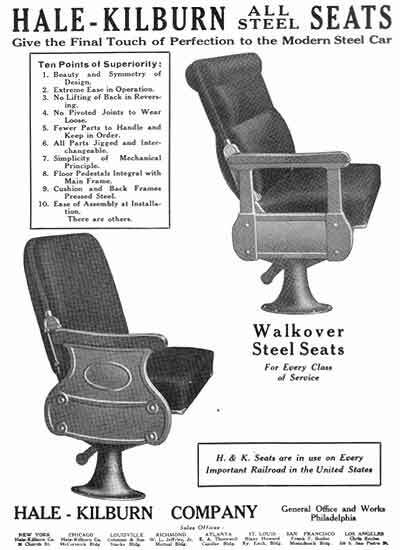 In September of 1920 the stockholders of the Wadsworth Mfg. Co. accepted a plan whereby, that company would be taken over by the American Motor Body Corporation. The $1,000,000+ merger, included the plant and assets of the Hale & Kilburn Corp. of Philadelphia. The transaction was finalized in November of 1920 when the assets of Wadsworth were conveyed, subject to all liabilities to the American Motor Body Co. with the shareholders of Wadsworth Mfg. Co. receiving in exchange a portion of the capital stock of the American Motor Body Co. (American Can Co.), secured by a first mortgage on the Wadsworth plant located at Kercheval and Conners Creek, Detroit. A similar arrangement was made with the Hale & Kilburn shareholders in Philadelphia. “The Retired Detroit Manufacturer Was the Husband of Mary Mannering, the Actress. “PALM BEACH, Fla, March 27, - Frederick Elliott Wadsworth, retired automobile body manufacturer of Detroit and Irvington-On-Hudson, died today at his winter home on Clarke Avenue here of a paralytic stroke. He was 58 years old. Stricken a week ago, his physicians said there was no hope and advised Mrs. Wadsworth to notify relatives of the sickness. “Besides Mrs. Wadsworth, Mrs. Stanley Robinson of Pasadena, Cal., a daughter; Horace Wadsworth, a son, and Mrs. Frederick George of Grand Rapids, a sister, were with MR. Wadsworth when he died. “Mrs. Wadsworth was formerly Mary Mannering, the actress. “Mr. Wadsworth was a son of James W. Wadsworth of Durham, Conn. He was formerly Secretary and General Manager of the Detroit Steel Boat Company of Detroit. After suffering through the Wadsworth strikes, Henry Ford realized that he could no longer depend on third parties for his automobile bodies so he authorized the conversion of the former Eagle boat plant at River Rouge into a massive body building facility. In late 1922 American Can’s Rodney Dean Day became vice-president and general manager of the American Motor Body Company, in charge of the Detroit and Philadelphia plants. Upon receiving his discharge from the Army, Day became associated with the American Can Company, and for some time had been in charge of American Motor Body Co.’s Philadelphia plant, which was referred to as the Hale & Kilburn division. As the American Body plant in Detroit ran along the north side of Jefferson Ave, with its northern border running along the south side of Kercheval St/Ave. it was commonly known as the Kercheval plant. Both Jefferson and Kercheval were re-numbered by the City of Detroit in 1921, which gave the plant a new address; 12262 Kercheval Ave, Detroit, Michigan. In addition to the Detroit and Philadelphia plants, American Body Co. maintained a Chicago sales office at 332 S. Michigan Ave. During 1921 and 1922 not much was heard from the American Motor Body Co. However all that changed when Charles M. Schwab became interested in the auto business. “Stutz Board Elects Two Schwab Directors - W.N. Thompson to Remain President. “Charles M. Schwab, Chairman of the Directors of the Bethlehem Steel Corporation, and Eugene V.R. Thayer, formerly President of the Chase National Bank, have bought with associates a controlling interest in the Stutz Motor Car Company of America from the Guaranty Trust Company of New York. At the time one of Stutz’s many shortcomings was their lack of an in-house body building department. Schwab’s advisors recommended that he purchase American Motor Body. The firm’s Detroit and Philadelphia plants were underutilized and its owner, the American Can Company was looking to sell. “NEW YORK April 20. - Charles M. Schwab, steel magnate, will shortly acquire an interest In the American Motor Body Company, It was declared today by R.H. Ismon, secretary treasurer of the company. A reorganization of the affairs of the company will be made Ismon stated. He said he did not know if Schwab would serve in any capacity when reorganized. As it turned out, the rumors were true, and on July 1, 1923 the American Motor Body Corporation, under the direction and control of Charles M. Schwab, succeeded the American Motor Body Company. Located at 1800 Lehigh Ave (corner of 18th St.), Philadelphia, Pennsylvania, its officers were as follows: Rodney D. Day, President; Robert I. Barr, Vice-President; Henry E. Mead, Secretary; C.M. Champion, Works Mgr. ; Carl H. Seitz, Pur. Agt. ; Parker Saybig, Elec. Engr. ; C.T. Hanson, Chief Engr. ; and A. Reuss, Supt. Stamping Plant. Directors included Schwab, Edward Richmond Tinker, (President of Chase Securities) Robert I. Barr, and J. Charles Mottashed. Engineering and design staff included: Charles Eustace Dwyer, C.T. Hanson, Henry E. Mead, Ernest Dean Dawson and Edward L. Clark. Day relocated Hale & Kilburn’s body-finishing and trimming staff to a satellite plant in Indianapolis located adjacent to the Stutz assembly plant. The Indianapolis Hale & Kilborn division painted and trimmed bodies in the white built by the American Motor Body plant in Detroit. Excess capacity was used to build small runs of bodies for other manufacturers such as the Trumbull Automobile Co. of Indianapolis. In April of 1924, the American Body Corp. announced that they had received a license from Goodyear Tire to build six wheel chassis for buses. Goodyear built several six-wheel trucks in which the four rear wheels transmitted power between 1918 and 1920. Various combinations were tested, including buses with three and even four axles. One of the prototype trucks made a coast-to-coast run of, 3,505 miles in 12 days, 14 ½ hours. The chassis included under-mounted worm-drive single-tired rear axles whose universal joints were interconnected by a rotating tubular member, which helped absorb braking and driving thrusts. During the lat teens a Goodyear engineer named Ellis W. Templin (1886-1966) had developed the system in collaboration Chester M. McCreery while working at the Goodyear Tire & Rubber Company’s six-wheel truck pneumatic-tire program. In order to increase the load-carrying capacity of 5-to 6-ton truck without increasing the load height of the truck bed, Goodyear engineers proposed to distribute the load across a pair of tandem axles with correspondingly smaller pneumatic tires. In 1920 they introduced their own vehicle, the Goodyear Six-Wheel Truck, and promptly set about staging a coast-to-coast run to advertise the cost-effectiveness of the concept. Templin’s earliest design used a combination worm and chain drive unit, but by 1923, he had developed a new, improved version with two worm drive axles. After working for Goodyear, Templin joined Six-Wheel as chief engineer to oversee production of the bogies, after which he went to work for Timken-Detroit Axle, served as chief automotive engineer for the City of Los Angeles Department of Water & Power and later founded his own firm, Micro-Nut Co. The licensing arrangement with Goodyear was simple, users of the Goodyear-Templin Bogie were required to install Goodyear rubber on whatever they built. In 1924 Schwab formed the Six Wheel Co., to handle the manufacture and distribution of the Safeway Six-Wheel coaches and trucks. Officers were as follows: Rodney D. Day, president; Ellis W. Templin, vice-president; Chester M. McCreery, chassis engineer; and Charles Eustace Dwyer, sales manager. Templin and Mc Creery were heavily involved in the development of the drive-train and chassis of the Six-Wheel. “New York. July 21. - Formation of the Six-Wheel Company to manufacture six-wheel motor buses and trucks was announced today by Charles M. Schwab, chairman of the new corporation. The company's product, a distinct feature in automotive engineering, will have the four rear wheel assembled in units, similar to some trucks and railway cars. Headquarters will be in Philadelphia." Another novel feature of the prototype - which was also credited to Templin - was the construction of its body, which was the first bus with coachwork - with the exception of the roof - made entirely of steel. In Uerdingen, Germany, Waggonfabrik Uerdingen AG served a similar pioneering role, building an all-steel body on a Bussing three axle chassis in 1925. Most Six-Wheel’s featured a rubber-mounted 109 hp, 6-cylinder, Continental Red Seal Model 15-H bus engine although different power-plants were available on special order. While the firm recommended that their customers use American Motor Body’s aluminum coachwork, many customers opted for less expensive composite bodies supplied by third party coachbuilders to Six-Wheel’s stringent engineering specifications. A surprising number of Six-Wheel coaches were built with double-decker bodies which could hold as many as 62 passengers. Most single-deckers were designed for 29 passengers, and many included an observation platform at the rear of the body. Completed vehicles ranged from between 30 and 45 feet in length, depending on the style of coachwork. One particularly long double-deck coach featured coachwork 12 ft. 4 in. high and 43 feet long. Three models of the six-wheel chassis were available; the Model 57 truck chassis; the model 64 single-deck chassis designed for combination city-service and parlor-car type coachwork, and the Model 66 double-deck chassis - all powered by a 109-hp 6-cylinder Continental Model 15-H Red Seal bus engine. Most single-deck Six-Wheel coaches were built with arcade roofs which permitted the body to be used for either express or city service with minimal changes. The vehicles standard coachwork’s side paneling was of aluminum, whose hollow vertical struts resting directly on the steel chassis. A typical single-deck Model 64, complete with seating and lightweight aluminum coachwork weighed in at 9500 lbs. Double-deck Model 66s were noticeably heavier, usually weighing just over 6 tons. Starting in late 1925 Model 64’s rear treadle doors were interlocked with the now-standard Westinghouse air-brake system for additional safety. A large number of bodies were built by Wolfington, including the famous Nairn Transport Company buses that ferried mail, freight, soldiers and oil workers between Beirut, Damascus and Baghdad. Two New Zealand brothers, Gerald and Norman Nairn, founded a weekly bus freight and mail service between Haifa, Israel and Beirut, Lebanon in 1922. A similar Baghdad, Iraq to Damascus, Syria route was instituted on October of 1923, and soon afterwards the two circuits were combined, creating a 715-mile-long Beirut via Damascus to Baghdad service. The Nairn’s first vehicles were 7-passenger Cadillac and Buick sedans, but the capacities of the vehicles were easily exceeded and when the frequency of the trips increased, a search for more suitable vehicles commenced. In 1925 Norman Nairn ordered a number of Six-Wheel bus chassis and commissioned Alexander Wolfington & Son to build them specially-built bodies, with first-class accommodations for 16 passengers, and enough space for 2 tons of freight and luggage. The coaches featured comfortable, high-backed seats and a two-place driver’s compartment which enabled the buses to drive non-stop through the night, reducing the 24 hour journey to less than 20 hours. Equipped with an 8-speed gearbox and a 110hp 6-cylinder Continental engine, the Nairn coaches had a top speed of 55 mph. The $17,500 vehicles weighed seven tons and could carry 1¼ tons of luggage on the roof. The Nairn coaches were equipped with huge Westinghouse shock absorbers as well as Woods projector beam headlight as were a surprising number of other Safeways. In 1927 Iraq’s King Faisal declared the Nairn Safeway Saloon Coach ‘The Babylon’. The Safeways were a great success serving the Nairns from 1925 through 1934 when they were replaced by a fleet of 10-passenger Curtis Aerocar trailers, towed by Buick coupes. Wolfington-bodied Six Wheel coaches were also used by the New York City’s Fifth Ave Coach Co., Boston’s Boston Elevated and Cleveland’s Ohio Light & Power Co. Many others were built by Cleveland’s G.C. Kuhlman Car Co. and the St Louis Car Co, St Louis, Missouri. Other coachbuilders known to have built bodies on Six-Wheel chassis include: Auto Body Co., Lansing, MI; American Car & Foundry Co., Berwick, Pennsylvania; Fitzgibbon & Crisp, Trenton, New Jersey; Lang Body Co., Cleveland, Ohio; and Hoover Body Co, York, Pennsylvania. The firm's expensive 4- and 5-ton Model 57 trucks included the Goodyear-Templin tandem axle system and were mainly sold overseas in Turkey, South Africa, India and the Sudan. The firm’s buses were popular in large cities, particularly New York, Cleveland, Detroit and Kansas City. Moreland began offering a similar six-wheeled chassis in 1925 and consequently only a handful of Safeway’s were sold in western states. It’s estimated that 400 six-wheel buses emerged from the American Motor Body Corp. Philadelphia plant between 1924 and the end of production in 1928. The 1925 Detroit directory lists Six-Wheel’s Detroit address as: 12262 Kercheval Ave., the same as the American Motor Body Corp. The firm adopted the ‘Safeway’ moniker early on and most of the firms advertising called its coaches Safeway Six-Wheeled buses. “City of Cleveland Hood-In-Front Double Deck Fleet, 58 units total 1925-1928 - Bldr: Safeway Six Wheel, Philadelphia; Length 33’; seats: 31 lower, 31 upper; two-man, driver and conductor (front entrance, rear exit: conductor stationed at rear platform and oversaw treadle-controlled rear door while driver had manual-operated front door). Chassis - Safeway Six-Wheel Model 66; engine - Continental 6-cyl gasoline; fuel tank - 38 gallons; front and rear doors. “#500-#529 D put into service in 1925; #530-#549 D put into service 1926; #550-#552 D put into service in 1927; #553-#558 D put into service in 1928. First day of double deck service November 7, 1925; in rush-hour only service after 1931; all out of service by January 13, 1936. A different source states that Detroit Motor Bus Company purchased a total of 62 Safeway Six-Wheel chassis, 26 with double-deck and 36 with single-deck bodies. Other users of double-deck Safeways included the Grosse Pointe Bus Co., Grosse Pointe, Michigan, the Fifth Ave. Coach Co., New York City, and the Detroit Northville & Milford Coach Co., Detroit, Michigan. Kansas City Railways, Kansas City, Missouri, received 18 63-passenger open-top double-deck Six Wheel Co. buses in 1925, all equipped with St Louis Car Co coachwork. Their fleet also included 5 30-passenger single-deck Six-Wheel Co buses with St Louis Car Co. parlor car coachwork. All of the firm’s Safeways were out of service by 1932. United Railways of St Louis, Missouri purchased 5 Six-Wheel Co 27-passenger pay-as-you-enter buses in 1925, all of which were bodied by St. Louis Car Co. In New York City, the Fifth Ave. Coach and Third Avenue Railway Companies were users of Six-Wheel coaches. A few Safeways were sold to Canadian operators. Four single-deck Safeways with American Body Co all-metal bodies were sold to the Montreal Tramway Co in 1925. At least one Six-Wheel chassis was made into a private land yacht. Holman Harry (Flannery) Linn, President of the Linn Mfg. Co. Morris, New York, commissioned the Linn Haven Highway Pullman in 1925. Built at a reported cost of $40,000, Linn wanted a private car for the highways similar to the railroad executives and their private Pullman Cars. After Linn sold his firm to the Republic Truck Co in 1927, he traveled up and down the eastern seaboard in his coach which was manned by his chauffeur and personal steward. After Linn was killed at the rudder of his private airplane, his estate sold the coach to Purcel Kingsley of Cohoes, New York, whose Hudson River Night Line operated a showboat steamship called the Buccaneer. Now a roving billboard/shuttle equipped with a search light and sound system, the Linn Haven picked up customers for Kate Parson's "Show Boat Revue” a risqué burlesque that took place onboard the Buccaneer once it left its mooring at Manhattan’s Battery Park. During Franklin Delano Roosevelt's 1932 presidential campaign, the Linn Haven ferried the future President and his entourage around Manhattan. In 1948 ownership of the Linn Haven passed to Hollis M Briggs of Troy, New York, who used the vehicle for private excursions. The vehicle was retired in 1962, and was purchased a decade later by automobile collector John Rich. The vehicle was recently purchased at Kruse’s Fall auction in Scottsdale, Arizona and currently resides in the Martin collection in Houston Texas. Kruse advertised the vehicle was used by Franklin Delano Roosevelt in 1932, and was used in the production of Showboat. It has sleeping quarters, a kitchen and a stage on the back. After a reported 5-year restoration the bus sold for $58,000 at Kruse’s 1998 Spring auction in Auburn, Indiana. It crossed the block later that year at Kruse’s Fall Auburn auction where it sold for $81,000. Nine years later it made an appearance at Kruse’s 2007 Fall auction in Auburn where it was hammered sold at $155,000, purchased by a Houston, Texas collector named Martin. “The Safeway Six-Wheeler is the most conspicuous and outstanding achievement since the development of the first motor coach. It is the result of determination to bring to highway transportation the luxury, comfort and safety of the high-powered limousine. “To achieve this ideal took six years of engineering effort. Five years of grueling road tests. A millions miles of merciless driving through all sorts of roads and weather. No coach ever had such searching tests. For the Six-Wheeler was so novel in idea, so remarkable in performance, that it was no placed upon the market until every last refinement was made and every claim established beyond shadow of doubt. “It is the successful application of the four rear wheels in tandem that makes the Safeway Six-Wheeler the outstanding achievement in coach design. Weight is distributed over all six wheels. So, for the first time on a coach of this capacity, the use of pneumatic tires with their superior cushioning qualities becomes both practical and affordable. “Drive is on all four wheels, two axles, independently sprung to the chassis, are so ingenious that each wheel moves up and down over road hazards independently of the others. When one wheel loses contact, the other three stay on the road. The special rim of the wheel meeting the obstruction. “Such surprisingly smooth running makes possible a speed that maintains time-table schedules. Along with a higher average speed comes safety that far exceeds existing motor vehicle standards. “Brakes on all four rear wheels give practical high speeds. Low center of gravity, a better tire design and six-point road contact bring users safety and reduce side-sway to a minimum. Due to air brakes skidding is practically eliminated. “The Safeway Coach is a revelation in form with a noiseless, all-metal body, with removable side panels. Plate glass windows in felted runs. Luxurious seating. All the case-carrying luxury that is commonly associated with only the finest closed cars. “Best of all, the Safeway is a protector of roads. Actual test made by the U.S. Bureau of Roads with a five-ton six-wheel truck showed the Six-Wheeler struck the road surface a blow of just 7,000 pounds as against 29,000 pounds from the ordinary four-wheel, solid-tired vehicle of the same weight. This saving of highways is a specific development which would in itself more than justify the years which have been spent to bring this amazing coach to its present perfection. "The automotive industry is one of the biggest industries of this country today. I am interested in two branches, Stutz Motor Car Company of America, incorporated, and the American Motor Body corporation. “While the industry generally has grown rapidly and has had its recession, I look for It to continue to grow and do not think the saturation point has been reached by any manner or means. "I have never made any money in speculation. I have always lost. I have only made money when I have taken a business over and started developing it. You cannot make money unless you develop a business, and put your head and soul in the work. “In America any man who does better in a business than the average will make a fortune. He will be a success. There is no country in the world that has so many opportunities America offers today. I would give a great deal to be 40 years younger." However rumors surfaced in the automotive trades that Schwab was about to sell one of his numerous automotive holdings. Two concerns located adjacent to the American Motor Body plant in Detroit were interested in purchasing the facility, the Hudson Motor Car Company, and the recently created Chrysler Corporation. Chrysler’s production staff struggled between 1924 and 1928 to increase manufacturing capacity to meet the growing demand for Chrysler cars. One way to avoid the delays and high costs associated with building brand new facilities was to purchase existing factories. American Motor Body’s Kercheval Ave. plant was just too tempting to pass up. The 5-year old plant was located directly across the street from the (former) Chalmers plant on Jefferson Avenue, and was completely set up for mass production of automobile bodies. In the years leading up to the sale, American Motor Body’s Detroit plant had been underutilized in its role as a production body supplier to Stutz. After the sale to Chrysler, Indianapolis’ Robbins Body Co. took over their role as Stutz’ production body builder, and were given the contract for the LeBaron-designed 1927 Stutz line. For a number of years Stutz had ordered custom bodies from LeBaron who built them in their Bridgeport, Connecticut factory. After Briggs purchased LeBaron in 1928, Stutz started ordering both their series custom and production bodies from the LeBaron-Detroit factory in Detroit. They ordered them "in the white" and had Hale & Kilburn paint and trim them in their Indianapolis plant. When Stutz went out of business in 1933, so did Hale & Kilburn. Between 1925 and 1941 the Kercheval Plant of the Chrysler Corporation, 12265 E Jefferson Ave., manufactured as many as 1,200 Chrysler, DeSoto, and Plymouth bodies per day. By the start of the war the facility had been expanded to a 23-acre facility with a total of 900,000 square feet of floor space. The new facility, commonly known as the Chrysler Kercheval plant, supplied bodies to Chrysler Corp’s Jefferson Ave plant until February 1990 when both were closed. Less than eight months after Schwab sold American Motor Body’s Detroit plant, it was announced that the Philadelphia factory was about to be sold. “that a deal may be eventually be made by which control of the American Motor Body Corporation, of which Charles M. Schwab is president, will pass to American Car and Foundry Motors Company, recently organized by American Car and Foundry, to acquire control of the manufacturing companies. American Motor Body Corp., manufacturers of the Six-Wheel Motor Bus made an offer of sale several months ago." American Car and Foundry was formed and incorporated in New Jersey in 1899 as the result of the merger of 13 smaller railroad car manufacturers. The unified company made a great investment in the former Jackson & Woodin Mfg. plant in Berwick, Pennsylvania. During the mid-20s ACF acquired a number of their competitors; 1924 - Pacific Car & Foundry; 1925 - Fageol Motors Company and Hall-Scott Motor Car Company; 1926 - J.G. Brill and Company and American Motor Body Corp./Six Wheel Company. When ACF acquired J.G. Brill, it acquired four other associated firms; American Car Co., Kuhlman Car Co., Wason Mfg. Co. and Cie J.G. Brill (Gallardon, France). In 1944 ACF and J.G. Brill were reorganized as ACF-Brill Motors. By 1928 a number of other firm were producing more affordable 6-wheel bus and truck chassis and production of the Safeway Six-Wheel coach ended. However, the associated Hale & Kilburn plant in Indianapolis continued to paint and trim bodies for Stutz through 1933, when both firms withdrew from business. Despite the 1926 sale of the firm to American Car & Foundry, and as late as January, 1929, Charles M. Schwab continued to list American Motor Body Corp. as one of his automotive holdings.